The Piano Encyclopedia Blog – The Piano Learning Revolution » The SECRET Development ! I have personally read them all, but we’ve received so many emails that I actually couldn’t answer all of them yet. First of all, I really want to THANK YOU for following The Piano Encyclopedia development, especially if you have been with us from the early beginning. We have been so busy on the development over the past few months, and even we updated the Community Chat Room with some short news, we actually missed the blog update… Actually on the last post I told you that we’re going to give away some free copies, but I actually didn’t finish telling you about HOW you can be one of the 25 people to receive a free full copy of The Piano Encyclopedia. …Well part of the answer is because we have been developing so many things I haven’t actually told you about! To tell you the truth, I really don’t know where to start. We made SO much incredible progress during the last few months that this project is nothing compared to what it was at the beginning. It’s actually bigger and much better! Even though I’ve been giving away some hints on our Community Chat Room, I actually didn’t want to tell you what we’re doing until we had everything worked out, we could actually SHOW you what we were doing, and we were close to give you an invitation to try it out. So the great thing about all this, is that TODAY, all those three conditions are true, and right NOW, right here, I am going to be able to show you some PREVIEWS of everything we have been doing the last few months! Stay tight, and I am also going to be announcing on this same post -for the First Time- the OFFICIAL RELEASE DATES, and the DATES of the upcoming EVENTS OF THIS MONTH. Yes, from now on, we’ll be stressing quite much on dates, so you’re able to follow the upcoming special release and preview dates for EACH month. You’ll also be able to see some changes in our blog layout by next week, as we’ll be adding a date calendar, as well as some other features to make date following easier. To begin, why not start by showing you a screenshot of a sample page of our Piano Encyclopedia? In this page you can see all the D Common Scales, directly from our Scale Dictionary. You can play the scales either up or down, watch the interactive animations, and get detailed info and composing tricks about each one by clicking on the Toolbar Buttons and links. So what has been going on in The Piano Encyclopedia’s LABS during these last few months? NOW our project is divided into 3 components. How come three? I mean, up till now I’ve only told you about just one, right? Yes, until now you had just heard about The Piano Encyclopedia itself, our practical guide to composing, improvising, and improving your piano skills, with more than 700 pages, 2500 piano recordings, and 2400 interactive illustrations of piano keyboards. · Interval Dictionary-> every interval explained, as well as their relation with chords and scales. · Chords Dictionary -> all standard chords and even all of the strange and exotic chords, full of expert’s tips for composing and improvising. · Composing & Improvising Tips-> find out all chords that can be used with a certain scale, typical chord progressions, and chord substitutions. · Interval, Chord & Scale Finder -> if you don’t know what you are playing, simply let the finder help you. Just input the notes and the finder will tell you what scale, chord, or interval you are playing. This is an extract of a page from the Chord Dictionary, where you would be able to see all the 12 Ninth Chords. You can play any of these chords, and activate the interactive animations by clicking the toolbar buttons and links. For example, by clicking on the rightmost toolbar button, you can actually explore any chord’s Inversions and Voicings, to discover how to create new exciting sounds. Discover how to Build all the Chords on ANY Key by mastering the Chord’s Musical Structure. 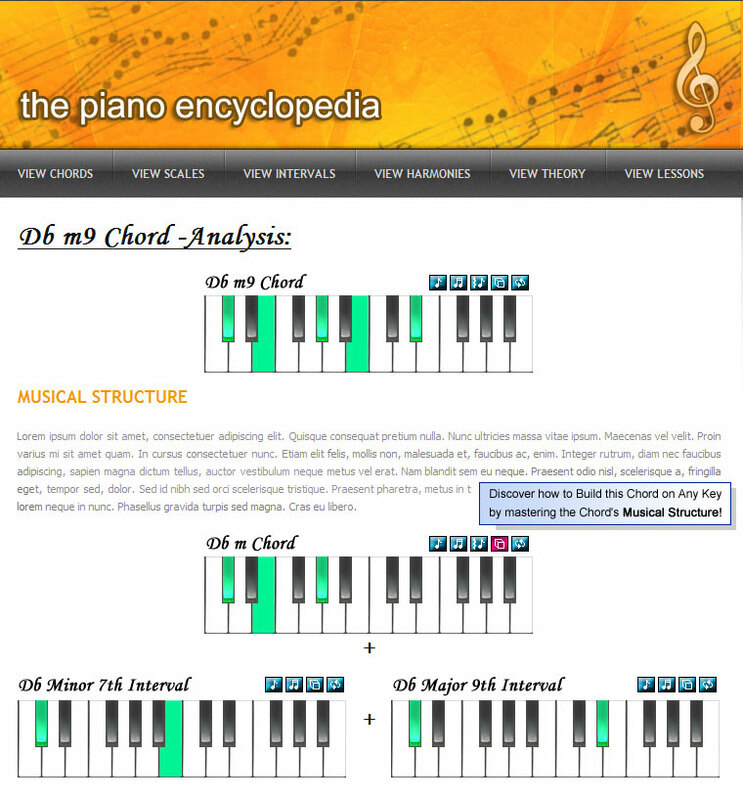 This sample page, for example, shows you how the Db m9 chord can be built on any key, by understanding the relation between the chord and the music intervals. In this case, we can see that playing a simple Db minor triad and adding and adding a Minor Seventh and a Major Ninth can create the Db m9 chord. Discovering how the intervals and chords relate to each other, you’ll find it more easier to master all chords on all keys, and even make your own chords. So we have advanced a lot on this, and we’re really happy with our progress. However, TODAY, I can say this is just the tip of the iceberg. The two other components that are now in development and complement everything I just mentioned, and I think they actually take the whole overall piano learning experience to another level. Even though The Piano Encyclopedia is a practical guide for composing, improvising, and improving your piano skills, we figured out that for some people –especially beginners- it could be difficult to know where to start especially with so much information available at the tip of your fingers. 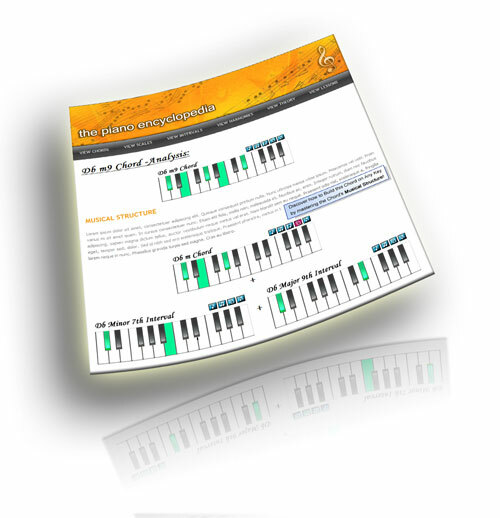 Also even though all of the above contains many interactive tutorials and explanations of how to harmonize a scale, suggestions of what chords to play given a certain melody, and how to create each of the explained chords in any key, we thought it would be a great idea to create a Step by Step guide, explaining everything from beginner level to advanced to master all the secret tricks of composing and improvising. Now I just call them ‘secrets’, but as you’ll get to see -and actually real soon (I’ll tell you why at the end of this post)- these are very powerful music concepts that are really easy to learn but that will probably change the way you see music. So in this way, The Piano Encyclopedia’s Main Piano Course has been born. 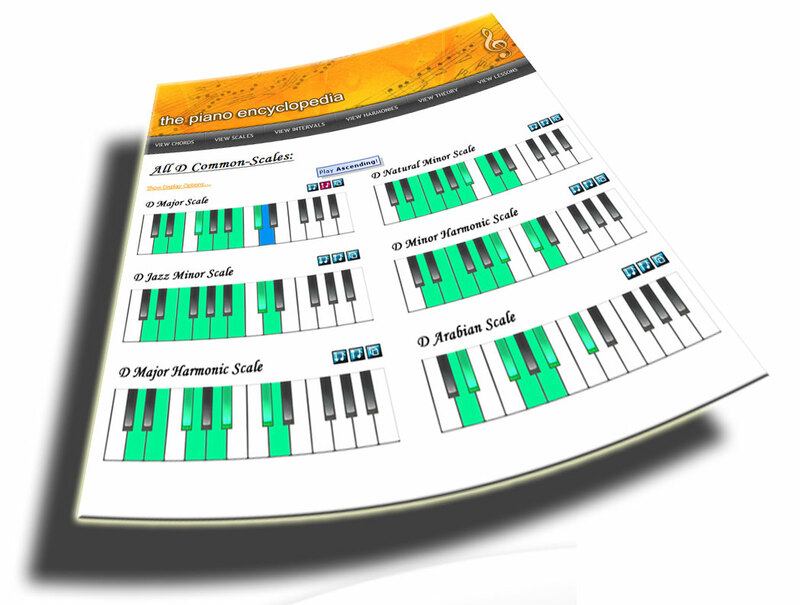 The idea is for it to complement the whole reference guide, so that you can master all the elemental scales and chords before going into learning the more exotic chords and scales of the rest of The Piano Encyclopedia. In this way, the idea is to transmit to you all the necessary knowledge so you can then use The Piano Encyclopedia’s Tools to boost all your compositions, improvisations, and improve your piano skills. 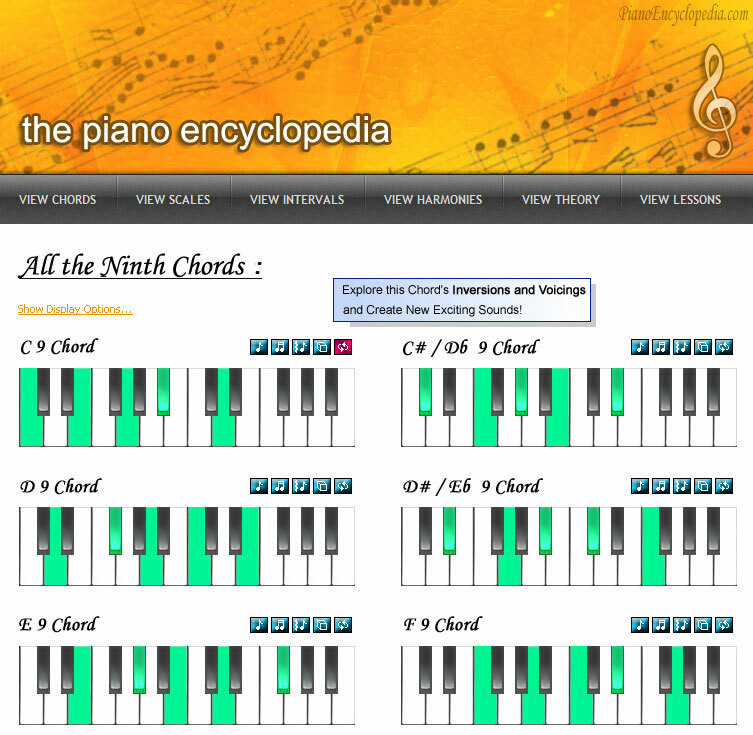 The best part of all of this is that the Main Piano Course is actually completely linked to The Piano Encyclopedia itself- meaning that you’ll be able to walk step by step through the lessons and with just a click you’ll be able to explore any topic in depth by going to the chords, intervals, scales, or harmony pages -from the actual lessons to The Piano Encyclopedia back and forth. If you don’t want to follow the actual lessons and create your own unique path, all the related pages of The Piano Encyclopedia will actually contain recommended chapters of the Main Piano Course lessons for you to read. I am going to tell you more about The Piano Encyclopedia’s Main Piano Course, in the upcoming posts, but before that, let me show you the Third component of our big project! I am going to give you a quick preview, but let me tell you that this is going to get as important as The Piano Encyclopedia itself, and stay tight cause I am going to show you how this final component ties everything together. We’re not talking about just a simple Chat Room as we have now. It’s a whole community system we built from the ground up that is completely connected to the previously named components. That is, the Piano Encyclopedia’s Main Piano Course is actually going to be held under our new community. First off this means that not only you’ll be able to enjoy the lessons and the interactive components of The Piano Encyclopedia, but also to ask questions to fellow pianists and musicians! So the new Piano Encyclopedia’s Community will be a place for you to share piano experiences with fellow piano students, teachers, composers, and professional musicians. Even more, you’ll be able to share your piano recordings, compositions, and your knowledge – and learn from other pianists in the community. However what will make this piano community different from any other is that it will actually be powered by The Piano Encyclopedia Engine! We have created a very powerful technology that actually detects and identifies any music keyword found on text: even any chord, scales, or interval name. What this means is that if you write a question on one of the lessons, or write a comment under the community’s forum, all the chord/scale/interval names will be auto-magically converted into their respective piano keyboard images plus their sound! But wait, that’s not all, moreover all the music keywords will be linked to the pages of The Piano Encyclopedia itself. What this means, is that anybody will be able to extend and complement the hundreds of pages of our Piano Encyclopedia, and all their written articles and lessons will be as interactive as The Piano Encyclopedia itself! You’ll also be able to make new friends and have a buddy list, a personal user profile, and share your piano performance recordings and compositions! Wow! As you can see this is all really big. But the great thing is that thanks to previous months of intense development, TODAY I can tell you that this is no longer an idea, but actually a dream come true for me and the whole team. We had actually thought of adding this community feature post the launch of the original Piano Encyclopedia, however the community had the potential of adding so much value to the overall piano learning experience that we had decided to work on that now – and it’s looking wonderful. This way, not only will you have tools for improving your piano skills, and boosting your compositions and improvisations, but also a whole community that will support you. A place where you’ll be able to share your recordings and show other people your progress, ask questions, and learn from a community that is using the same lessons and tools as you’re using. In this way, as you can see now, everything will be fully connected: The Piano Encyclopedia, the Piano Main Course Lessons, and the Community. Enjoy interactive piano lessons and music-related articles written by members of the community, and interact with them, in the User’s Piano Blogs section. Interact with people that love the same stuff that you do, join the current User Groups or create your own: make your own Jazz, Blues, Chopin, Bach, or anything-you-love piano Group, and let people in. Find people with similar interests and add them to your Friends List. Follow what they are doing, send them private messages, share your posts with them, or even write messages to them on their Profile Wall. The good thing is that we will open The Piano Encyclopedia Community to you guys exclusively real soon –before the rest of the developments. Apart from you getting to try all those new features, we thought the community would be a great idea to get to know each other, and listen more closely to your feedback and comments, specially using the new forum. 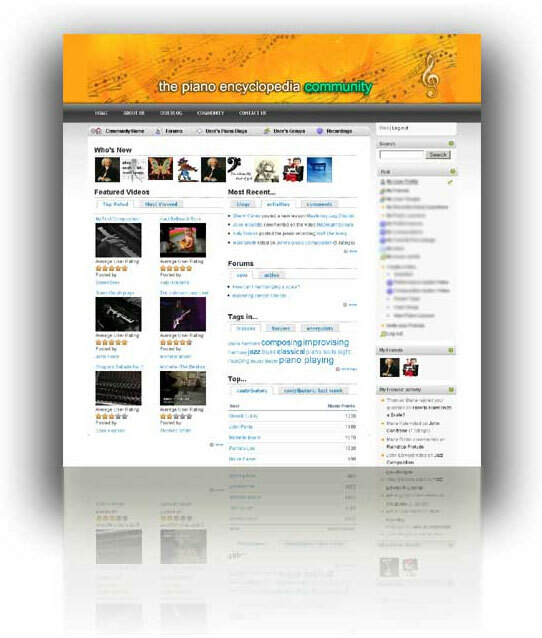 Many of you sent me emails proposing to add a Beta-Testers forum, so it will be great to use our new forum, real soon. I guess it’s time for the PREVIEW!!! Ask Questions to fellow piano students, teachers, composers, and professional musicians. Share your progress, participate into piano recordings, compositions and composition contests– and learn from other pianists in the community. Make friends with people that are using the same lessons and tools you’re using and enjoy user created content. Please click on the image to see it more closely. I’ll tell you more about the Community’s exciting features in our next post, and eventually you’ll get to try them all! However, I know that you have been anxiously waiting, and so we have thought a lot about you and how to make your waiting time more enjoyable. For this reason, we have decided to release from now on periodic PIANO LESSON REPORTS! These are going to be piano lessons reports that we’re going to be releasing every two or three weeks! While we continue creating the rest of the product and developing the new Piano Encyclopedia’s Community, we have decided to release some periodic piano lesson reports so that you can start practicing chords, scales, and get a sneak peek into composition and improvisation tips, even before The Piano Encyclopedia comes out! These lesson reports will not be releases of the content of The Piano Encyclopedia’s Main Lessons themselves, but actually just independent lessons that I’ll be taking the time to write myself, while you wait for the Main Lessons to be finished :o). Yes, I’ll be writing these lessons reports for you, as my idea is to share with you all the tips from my own piano classes and tell you about the music concepts that changed my piano skills completely during my 14 years of piano playing. As I mentioned previously on this post, I really want for you to learn all those simple but powerful music concepts that really changed my piano life. 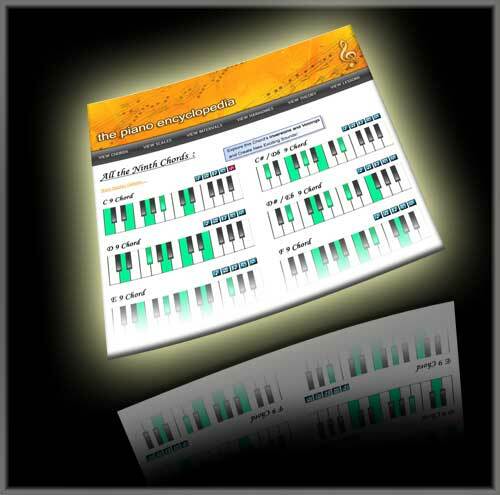 We really want to THANK YOU for all this time you have been anxiously waiting, so we hope that these piano lesson reports that I am going to prepare for you, every two or three weeks, make the waiting time shorter and a more enjoyable ride, while we test and finish developing the Piano Encyclopedia’s Main Piano Lessons courses, the new interactive Community platform, and all the new exciting features that we’ve working on the past months. However the greatest thing of all, is that TODAY I can also tell you that the first Piano Lesson Report is almost ready, with now more than 35 pages full of content and tons of graphics! So stay tuned, as the first Piano Lesson Report will soon hit your inbox! We’ll be announcing the exact release date of this first Lesson Report this Friday 19th, but I’ll assure you’ll get a copy before two or three weeks from today. So many people have sent us emails about this and sent us tons of emails about this. Therefore, we have decided to publish for the first time an OFFICIAL RELEASE DATE! 19th of September (This Friday): We’ll be posting the next blog update and I’ll be announcing the exact date of the release of our Piano Lesson Report! Remember I assure you that you’ll have it in your inbox in less than two weeks, but on this Friday we’ll announcing the exact date! I’ll also be telling you more about our community and the main lessons, and show you more previews on everything we’ve been developing. We’ll be also making an update on our blog layout by adding a calendar so you can keep up with the upcoming dates and events more easily! December 15th of 2008: date for the OFFICIAL PIANO ENCYCLOPEDIA RELEASE. UPDATE: Given the incredible feedback we have received about our Music Fundamentals eBook (You may read some VERY intresting comments from fellow pianists here) we have been greatly inspired and decided to focus first on releasing the Piano Encyclopedia’s Main Piano Lessons, before we release everything else. In this way, during the last months we have worked on expanding our lessons with new sections and new interactive tools (you may read an update here) so as to include everything necessary for mastering composing and improvising – step-by-step – from beginning to advanced. And the great news is that they are looking absolutely great, and at this point, we expect to be releasing them very very soon! Today, I invite you to reserve your FREE copy of our 100 page eBook “Music Fundamentals”. Yes, we are giving it away for free, as we want to THANK YOU for all your support, and since we definetely want to make your waiting time shorter as you wait to enjoy each of the components of the Piano Encyclopedia’s Piano Learning Experience. Regarding how to get 25 free FULL copies of the final version of The Piano Encyclopedia once everything is finished, I can only tell you by now, that this is going to be related to a contest we’ll run on our new Community! So stay tuned and really THANK YOU for all your support and following the Piano Encyclopedia development. All you comments and feedback we’ll be more than welcome so please make sure to write a comment in this post. How long have you been playing piano? I an really intrested in meeting each of you, so stay in touch and tell me more about you by posting a comment! Stay tuned for next update on this Friday 19th! 23 Responses to The SECRET Development ! I thank you very much for this website, in my point of view I would say it will most likley contribute into the comeback and the revolution of the piano once again. This website will help so many people with there piano work and create a useful(unlike the others online) piano community which can discuss and help students/teachers with real piano issues! I am happy to finally see all the pianos needed information to be gathered in one single site and will be using this site and contributing to it without doubt. We have been working really hard during the last few months and I can say that we’re actually super happy with the results we’re getting with our system. So we hope that with The Piano Encyclopedia we are able to provide a superior piano learning experience and definetely take piano learning to another level. Stay tuned for tomorrow, Friday 19th, as at 20:00 EST Time we’ll be announcing the EXACT day we’ll release the first Piano Lesson Report! Ali, stay in touch and really thanks for such a wonderful comment! QUESTION 1) How long have you been playing piano? Or are you looking forward to it? I have been playing the piano for more than 14 years and I love it! QUESTION 2) What are you most interested in learning? I love composing and improvising, discovering new sounds and new ways of enriching my creations. I love composing and improvising while playing the piano, or playing songs by ear. My compositions range from Waltzes -very much influenced by Chopin 🙂 – to more modern Jazz or Blues pieces, and even some Romantic Pop -like ballades. QUESTION 3) Which music styles, composers, or music groups are your favorite? For Classical music, my favorite composers are: Bach (also a great fan of Glenn Gould! ), Beethoven, and especially Chopin. I really enjoy playing his waltzes and listening to Ballade No. 1, but from Bach I specially like the Goldberg Variations. I’m really excited about the good news, so I’ve been waiting since the day I found your web site. I have always wanted to learn piano, although I have no idea about how to do it. I thought this should be a thing for “virtuosos”, but not for me. Anyway, I invested some bucks in an electronic Yamaha keyboard and tried to play some notes. So, actually, I’m interested in learning all about piano, from zero: chords, intervals, composing tips… I dream with the day I can play “Für Elisa” or “The Turkish March”. Thank you for your effort and your great idea! I’ll stay alert for the next news. Even though The Piano Encyclopedia is both for beginners, intermediate, and advanced students alike, we actually weren’t sure about where to start the Piano Report Lessons. Luckily for you, and probably for many other people that are just starting out, our first Piano Lesson Reports starts right at the beginning! This will be a great recap for most intermediate and advanced students too, as we’ll be teaching some fundamentals with a different approach. We’ll be quite stressing on understanding the relationship between chords, scales, and music intervals- right at the beginning- so you’ll be able to see songs from another perspective and advance quite fast, as we move quickly into the world of composing, improvising, and understanding music! “Für Elisa” is a lovely piece, it was also once of my first. Pedro, Thanks so much for your support! Make sure to keep in touch and tell more about you! P.S: Bach Minuets are also really nice pieces to start. I Highly recommend them and they are really lovely. Specially Bach’s Minuet in G major. Thanks so much for the update on what sounds like such an amazing product. I really want to learn how to improvise/compose on the piano, but I don’t know where to ge started. And being a college student, I have absolutely no time for lessons! I’ve looked before for books to help me with harmony and chord progressions, but I never found anything that really fitted my needs. Until I saw what you guys were working on here. Thanks so much for all your hard work and dedication, I can’t wait for Dec. 15th! It used to take me months to prepare some pieces, and with college it was hard to keep it up. However, the great thing about improvising and composing is that you’ll be able to just sit on the piano and play new songs right on the spot. Regardless of time issues, I also find it like a whole new way of communication and expressing myself, as now I can not only try to convey a composer’s intention through my playing, but to also to transmit how I am feeling at particular moment through my own pieces. 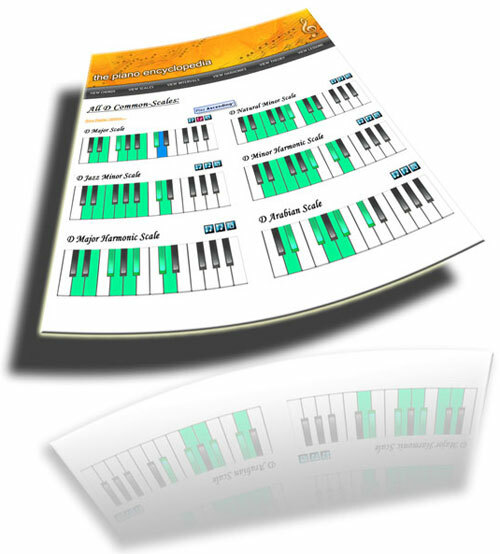 Stay tuned as we’ll be going over chord progressions soon in the our Piano Report Lessons releases! Austin stay in touch and thank you! Thanks for replying! I’m a freshman chemical engineering major, and even now, I’m struggling just to find enough time to sleep! To you and your team, thanks again for putting the Piano Encyclopedia together. You guys are heroes to pianists everywhere, whether they know it or not! I just wanted to say thank for developing the Piano Encyclopedia ❗ After practicing piano for a little over 2 months now I’ve come to love the instrument and have developed a real passion for practicing. Like many others, I, too, have developed an interest in improvisation. I feel like it must be considered THE way to personalize your music and develop your own ‘sound’. Right now I’m in the process of learning all my chords so I can’t wait to see the final release of The Piano Encyclopedia; it looks like it will be a HUGE help in the chord learning dept. Its a real relief to know that The Piano Encyclopedia is helpful for beginners, intermediates, and advanced players as well. I’m sure I will be using it to develop my skills from throughout my piano playing experience. I first became interested in piano listening to classical music on NPR and our local Public Radio broadcasts, especially at night-time. But I’d love to list them out for you (ah, I can just hear them playing now 😀 ) Bach Goldberg Variations, Partita in B Flat (Dinu Lipatti), Beethoven’s Sonatas, Mozarts Concertos 20 & 21, Scott Joplins The Entertainer, Schubert, Chopin, Debussy, Brahms… ahhh so much! Maybe I’ll pick up enough blues piano to take on some of his music someday. For now its a great inspiration. OK then. First of all, and at the risk of quoting someone else, I really believe this project is going to cause a revolution. A lot has become possible over the last decade because of the internet, but there’s still a lot to be achieved and possibilities to explore, and I think The Piano Encyclopedia is a great example. – I really don’t play piano anymore. I used to play, mostly when I was in highschool. I even have a couple of music conservatory years to back me up, but nothing else. When I graduate (or if i graduate), I plan to begin playing again. – I think that piano, as an art that is, is widely understood. What nearly nobody knows is the science behind it all (you know: resonance, ondulatory physics, and so on…). I think that a basic understanding of these concepts could make any pianist better than he or she already is. Teaching methods is also another topic that leaves room for improovement and creativity. – As an argentinean, I like our very own national rock, though I think there hasn’t been a good song since the 80s. However, currently I’ve become some sort of music “consumer” instead of listener, and I, more often than not, find myself liking particular songs more than styles or even authors. Pingback: The Piano Encyclopedia Blog - The Piano Learning Revolution » The First Piano Lesson Report’s Exact Release Date IS…. How long have you been playing piano? Or are you looking forward to it? About 5 years in total. Played a couple of years when I was a teenager, but gave it up for about 10 years, until I went back to playing the piano for about three years ago. I want some new challenges on the piano, other than learning to play other people’s pieces, and I found that challenge in trying to compose myself. I’m interested in learning to compose on piano, and, later on, maybe even orchestrate the pieces for an orchestra. At the same time I hope I cen get some tricks with me, as far as improvisation goes. Which music styles, composers, or music groups are your favorite? Thank you so much for developing this site. This might become one of the great resources I need in my desire to compose music and become even better on the piano. Regarding your music preferences, I also like many varied styles, but you surprised me with your interest on “music for movies”. Lately, I have been much into that, and it’s actually one of the types of music I most enjoy regarding composing. So in this way, what I love to do with some special people is to tell them an introduction to a short story that describes a scene and then play the song for them. Then I ask them afterwards what did they imagine and how did the story end for them. For me, this way of transmitting my emotions through my compositions has been one of the most rewarding experiences, as I get to know if the listener really felt the same emotions I meant to transmit. This one is actually a minor Eleventh Chord, with 6 notes, but played in a very particular voicing, separated by Fifths, which gives it a very intresting sound. In this way, the chord covers two octaves. Then try playing the same chord type in keys C, F, and G, and play them in arpeggio form. If you’re intrested, soon, I’ll share with you the piano keyboard images of this chord, it’s recording, as well as how to play it the different keys. There is also a major version, which has a really interesting and bright sound. P.S: Stay tuned as on October 5th at 4pm EST Time – less than two weeks- the first Piano Lesson Report will be released! I would like learning composition and mainly to know the music structure in order to get skills to play someone song. I am very interested on the course and I have a logic question: How much it cost? I studied piano when I was little but not for too long. Now I am 29 and I’ve re-started studying piano four months ago. I am interested in learning more about music-language. I am doing some’ear-development’.My teacher is a very good teacher and I am learning a lot, I am very satisfied with her teaching. The only problem is that she is moving far away in November and I don’t want to loose what I’ve learned because I am doing a very good progress.I am amazed !! I started last week composing some simple songs that I used to play in my guitar.My own songs, and I think that’s great !! They sound so beautiful in the piano. I like beethoven, etc… I like pretty much all music but I prefer to play soft music. I like rithms, sounds, scales, I enjoy listening and learning them. One of my music-challenges is learning to compose and play rock and roll !! … I am just a begginer !!!! Well, i’ve been playing piano for about 6 months, but i’m kind of frustrated becuase i can’t improvise or compose freely yet, i have to read the notes from the music sheet and that’s not what i’m looking for, so i’d like to learn how to compose and improvise, that’s what i’m looking forward to. so thank you for having such a great idea and developing the site. Finally, i just want to thank you and your team for developing such a great website, where you can find real help with piano issues. First let me tell you that I can feel a lot of enthusiasm about the project, and thanks to all of you for that. 1.- I have been trying to learn by myself piano since march of this year, but I haven’t practicing regularly. I learned the basic mayor notes, scales, triads, the minor notes, and some blues basics such as the 12 bar progression. I learned the piano intro of a song made by Genesis, hearing it out by ear. Just as a side comment, I have been also playing guitar for about 10 years, bass guitar for 1 year, and drums for 3 years. 2.- I am most interested in learning and know by heart the scales and notes of any kind, so that I feel I am able to add piano to a tune. I want to be able to accompany the right hand notes with the correct left hand notes in the piano. Piano would help me compose better songs relate better to the guitar sounds. 3.- I love Rock, classic rock, progressive rock and a bit of grunge. Classic music has also its charms. I admire and like jazz and blues of course. I like Genesis, Yes, King Crimson, Rush, The Beatles, The Who, Gentle Giant, Al Di Meola, Coldplay, Radiohead, Spocks Beard, Kevin Gilbert, etc. Pingback: The Piano Encyclopedia Blog - The Piano Learning Revolution » Musicians are not born - they are made. Discover The Logic Behind Music! Hi been trying to teach myself for years… to many piano courses to count and to much money spent. I am a song writer and singer and my goal is to accompany myself, and write songs that have more than chords 1,4,5 in them and now i know i can, thanks to your E book. No one EVER TOLD ME about tension and release. Want to play Christian based songs with a jazz flair. I read you have chord types that go in particular to what style played, that is exciting. Its been difficult to do rock or classical, when they dont interest me.. no offense, im 51yrs old, gotta focus.